The Turkish lira jumped more than 2.5% Thursday. NBC reports Washington and Ankara have reached an agreement on the release of a detained American pastor. 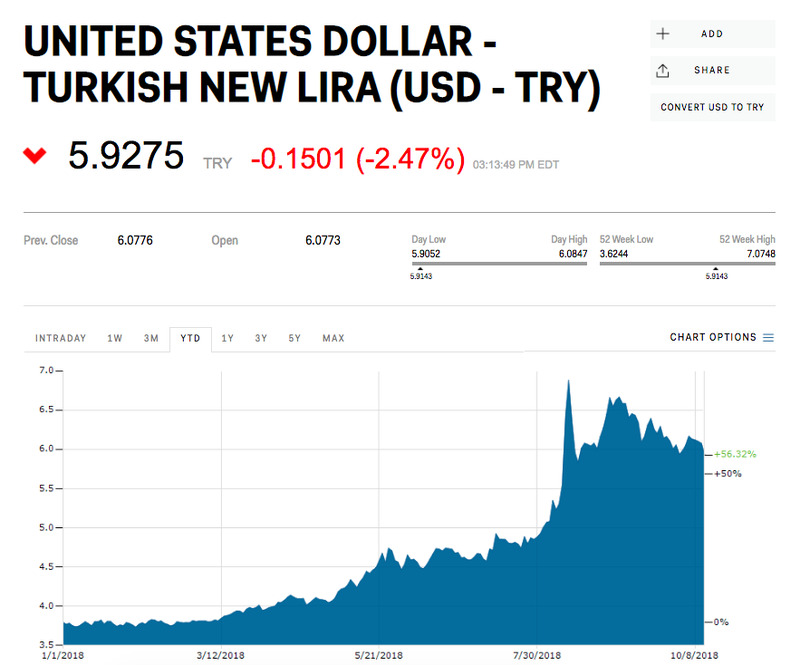 The Turkish lira jumped Thursday after reports its government could release a detained American within days, a step toward resolving tensions between Washington and Ankara that have helped roil the currency in recent months. NBC News first reported the White House reached a deal with the Turkish government to release North Carolina pastor Andrew Brunson, who has been detained in the country for two years, if certain charges against him are dropped. The US would ease economic pressure on Turkey as part of the agreement, two senior administration officials told NBC, although it isn’t yet known what measures it might include. After the two countries failed to make progress on negotiations for Brunson’s release in August, President Donald Trump doubled the rates of import taxes on Turkish metals. His administration had also placed sanctions on high-level Turkish officials earlier this year. Brunson was arrested in 2016 on alleged terrorism and espionage charges, which he denies. He was in prison until July and has since been moved to house arrest. The next court hearing is expected to take place Friday. Recent conflicts between Turkey’s central bank and government have put pressure on the lira, which has shed nearly 40% of its value this year and is one of the worst-performing currencies of 2018. Turkey’s treasury and finance minister, Berat Albayrak, unveiled on Tuesday new measures aimed at curbing inflation, which hit its highest level in more than a decade in September at around 25%, including price controls and lower bank loan rates. The central bank drew backlash from President Recep Tayyip Erdogan, who backs unorthodox policies like cutting rates to curb inflation, after raising its key rate to 24% last month.